Frances enjoys the subtlety of coloured pencil or the versatility of acrylic to capture the nuances of a head study or the effects of light and contrast, usually with a design element. Based in Norfolk, although Frances finds all horses equally wonderful to paint, whether large or small, she is becoming increasingly well known for her works celebrating the strength and dignity of her local heavy horse breed, the Suffolk Horse. 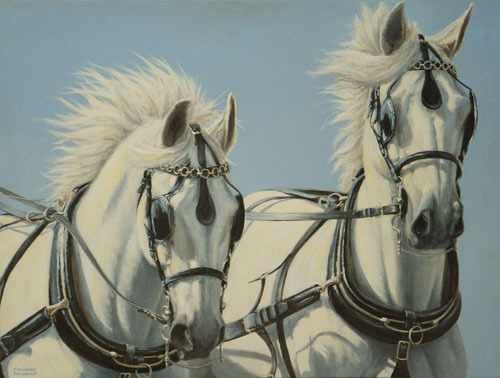 Although horses are her main focus, Frances also uses her keen observational skills to paint other subjects as diverse as railway engines, vintage vehicles, domestic animals and wildlife. Frances’ work may be seen across East Anglia and for many years she has had work regularly selected for the National Exhibition of Wildlife Art and Society of Equestrian Artists exhibitions.